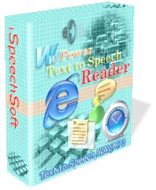 Welcome to Power Text to Speech Reader, the world's most popular Text To Speech tool. Power Text to Speech Reader is an award-winning text-to-speech player that lets you listen to documents, e-mails or web pages instead of reading on screen,it uses voice synthesis to create spoken audio from text with natural voices. You can listen on your PC or save text to MP3 or wave files for listening later.Only 21.95 . Changes your voice (or synthesized voice) to hundreds of new and high-quality voices of a man, woman, girl, boy, or baby. Changes voice in real time with high-quality and natural voice output. Compatible with almost any audio video programs, the Voice Chat Rooms, Instant Messengers, Audio Video Conferencing, PC-to-Phone, Voice Gaming as well as the Media Players, Recorders and DVD, CD, and Karaoke Players. WeatherAloud brings you forecasts and conditions from other cities and regions you select from around the world. Build a personal list for your own talking desktop weather report. NewsAloud read a daily custom newscast to you on your PC or portable device. Stay up to the minute on current events and breaking news. Manage your investments and business interests by letting StocksAloud track companies for you. Have stock information read aloud for quick or full updates as well as listen to headlines for related stories. NextUp Talker is a Text To Speech application specifically designed for people who have temporarily or permanently lost their voice. Copyright (c) 2011 1SpeechSoft, Inc. All rights reserved.